CCTM-500BT is a basic tank of the modular cylindrical-conical tank CCTM-500 with recommended effective volume 500 liters and total volume 600 liters for fermentation, maturation (and also storage, filtering, bottling, filling into kegs) of beer, cider, wine and other beverages. Made of stainless food steel DIN 1.4301 (AISI 304). This description, offer and price include only the BASIC TANK without additional equipment and accessories described in the section “Optional equipment” . 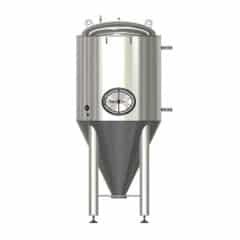 CCTM-600BT is a basic tank of the modular cylindrical-conical tank CCTM-600 with recommended effective volume 600 liters and total volume 720 liters for fermentation, maturation (and also storage, filtering, bottling, filling into kegs) of beer, cider, wine and other beverages. Made of stainless food steel DIN 1.4301 (AISI 304). This description, offer and price include only the BASIC TANK without additional equipment and accessories described in the section “Optional equipment” . CCTM-750BT is a basic tank of the modular cylindrical-conical tank CCTM-750 with recommended effective volume 750 liters and total volume 900 liters for fermentation, maturation (and also storage, filtering, bottling, filling into kegs) of beer, cider, wine and other beverages. Made of stainless food steel DIN 1.4301 (AISI 304). This description, offer and price include only the BASIC TANK without additional equipment and accessories described in the section “Optional equipment” . CCTM-800BT is a basic tank of the modular cylindrical-conical tank CCTM-800 with recommended effective volume 800 liters and total volume 960 liters for fermentation, maturation (and also storage, filtering, bottling, filling into kegs) of beer, cider, wine and other beverages. Made of stainless food steel DIN 1.4301 (AISI 304). This description, offer and price include only the BASIC TANK without additional equipment and accessories described in the section “Optional equipment” . CCTM-500A1 is a pre-configured modular cylindrical-conical tank CCTM-500 in recommended configuration A1. 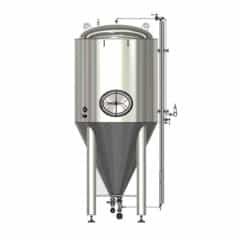 This tank has effective volume 500 liters and total volume 600 liters and it is designed for the fermentation, maturation (and also storage, filtering, bottling, filling into kegs) of beer, cider, wine and other beverages, according on selected type of the basic tank (see a tab bellow). Made of stainless food steel DIN 1.4301 (AISI 304). CCTM-500A3 is a pre-configured modular cylindrical-conical tank CCTM-500 in recommended configuration A3. This tank has effective volume 500 liters and total volume 600 liters and it is designed for the fermentation, maturation (and also storage, filtering, bottling, filling into kegs) of beer, cider, wine and other beverages, according on selected type of the basic tank (see a tab bellow). Made of stainless food steel DIN 1.4301 (AISI 304). CCTM-500A2 is a pre-configured modular cylindrical-conical tank CCTM-500 in recommended configuration A2. This tank has effective volume 500 liters and total volume 600 liters and it is designed for the fermentation, maturation (and also storage, filtering, bottling, filling into kegs) of beer, cider, wine and other beverages, according on selected type of the basic tank (see a tab bellow). Made of stainless food steel DIN 1.4301 (AISI 304). CCTM-600A1 is a pre-configured modular cylindrical-conical tank CCTM-600 in recommended configuration A1. 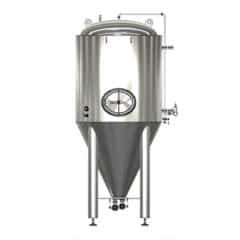 This tank has effective volume 600 liters and total volume 720 liters and it is designed for the fermentation, maturation (and also storage, filtering, bottling, filling into kegs) of beer, cider, wine and other beverages, according on selected type of the basic tank (see a tab bellow). Made of stainless food steel DIN 1.4301 (AISI 304). CCTM-600A3 is a pre-configured modular cylindrical-conical tank CCTM-600 in recommended configuration A3. This tank has effective volume 600 liters and total volume 720 liters and it is designed for the fermentation, maturation (and also storage, filtering, bottling, filling into kegs) of beer, cider, wine and other beverages, according on selected type of the basic tank (see a tab bellow). Made of stainless food steel DIN 1.4301 (AISI 304). CCTM-600A2 is a pre-configured modular cylindrical-conical tank CCTM-600 in recommended configuration A2. This tank has effective volume 600 liters and total volume 720 liters and it is designed for the fermentation, maturation (and also storage, filtering, bottling, filling into kegs) of beer, cider, wine and other beverages, according on selected type of the basic tank (see a tab bellow). Made of stainless food steel DIN 1.4301 (AISI 304). CCTM-750A1 is a pre-configured modular cylindrical-conical tank CCTM-750 in recommended configuration A1. 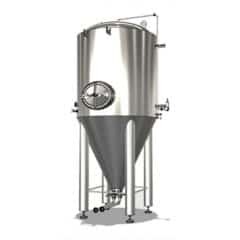 This tank has effective volume 750 liters and total volume 900 liters and it is designed for the fermentation, maturation (and also storage, filtering, bottling, filling into kegs) of beer, cider, wine and other beverages, according on selected type of the basic tank (see a tab bellow). Made of stainless food steel DIN 1.4301 (AISI 304). CCTM-750A3 is a pre-configured modular cylindrical-conical tank CCTM-750 in recommended configuration A3. 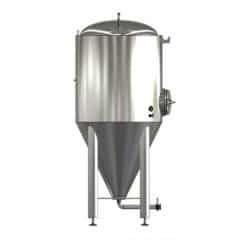 This tank has effective volume 750 liters and total volume 900 liters and it is designed for the fermentation, maturation (and also storage, filtering, bottling, filling into kegs) of beer, cider, wine and other beverages, according on selected type of the basic tank (see a tab bellow). Made of stainless food steel DIN 1.4301 (AISI 304). CCTM-750A2 is a pre-configured modular cylindrical-conical tank CCTM-750 in recommended configuration A2. 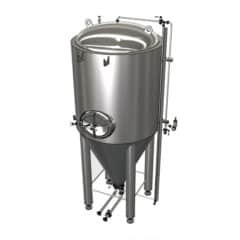 This tank has effective volume 750 liters and total volume 900 liters and it is designed for the fermentation, maturation (and also storage, filtering, bottling, filling into kegs) of beer, cider, wine and other beverages, according on selected type of the basic tank (see a tab bellow). Made of stainless food steel DIN 1.4301 (AISI 304). CCTM-800A1 is a pre-configured modular cylindrical-conical tank CCTM-800 in recommended configuration A1. 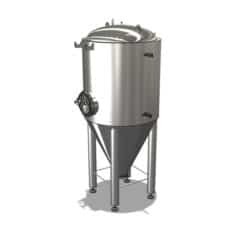 This tank has effective volume 800 liters and total volume 960 liters and it is designed for the fermentation, maturation (and also storage, filtering, bottling, filling into kegs) of beer, cider, wine and other beverages, according on selected type of the basic tank (see a tab bellow). Made of stainless food steel DIN 1.4301 (AISI 304). CCTM-800A3 is a pre-configured modular cylindrical-conical tank CCTM-800 in recommended configuration A3. 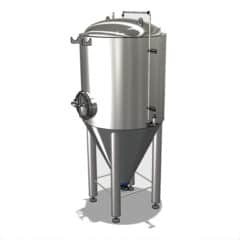 This tank has effective volume 800 liters and total volume 960 liters and it is designed for the fermentation, maturation (and also storage, filtering, bottling, filling into kegs) of beer, cider, wine and other beverages, according on selected type of the basic tank (see a tab bellow). Made of stainless food steel DIN 1.4301 (AISI 304). CCTM-800A2 is a pre-configured modular cylindrical-conical tank CCTM-800 in recommended configuration A2. This tank has effective volume 800 liters and total volume 960 liters and it is designed for the fermentation, maturation (and also storage, filtering, bottling, filling into kegs) of beer, cider, wine and other beverages, according on selected type of the basic tank (see a tab bellow). Made of stainless food steel DIN 1.4301 (AISI 304). CCTM-500B1 is a pre-configured modular cylindrical-conical tank CCTM-500 in recommended configuration B1. 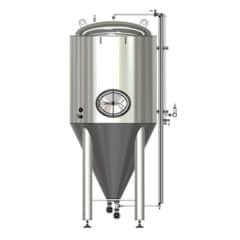 This tank has effective volume 500 liters and total volume 600 liters and it is designed for the fermentation, maturation (and also storage, filtering, bottling, filling into kegs) of beer, cider, wine and other beverages, according on selected type of the basic tank (see a tab bellow). Made of stainless food steel DIN 1.4301 (AISI 304). CCTM-500B2 is a pre-configured modular cylindrical-conical tank CCTM-500 in recommended configuration B2. This tank has effective volume 500 liters and total volume 600 liters and it is designed for the fermentation, maturation (and also storage, filtering, bottling, filling into kegs) of beer, cider, wine and other beverages, according on selected type of the basic tank (see a tab bellow). Made of stainless food steel DIN 1.4301 (AISI 304).